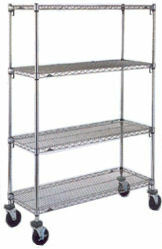 -Metro Super Adjustable Super Erecta Shelf Truck with wire shelves feature open-wire chrome shelves which boast a unique corner release system that allows you to effortlessly adjust the shelves' position without the use of tools. -Super adjustable chrome open wire shelves are NSF listed. -Shelf ribs run front and back, allowing you to slide items on and off shelves smoothly. -Shelves can be adjusted in 1" increments along entire length of the SiteSelect posts. -3-1/2" donut bumpers protects wall from marks..